Simple maintenance. This is probably the biggest benefit of PVC decks and docks. With PVC decking, there’s no need to reseal, repaint or re-coat your dock. PVC naturally resists mold, mildew, staining and damage from regular sun, freshwater and saltwater exposure. Heat dissipation. Anyone who has stepped onto a scalding hot deck or dock knows how terrible that experience can be. Instead, you can count on our PVC decking to successfully dissipate heat. You can walk barefoot on many of our PVC decks or docks without feeling the heat. Old school decks and docks used to be seriously heavy. A heavy dock has many restrictions in size, shape and construction type. But with our lightweight PVC decking, you can enjoy more flexible building and increased safety. Splinter & termite free. When it comes to the benefits of PVC decking in Pompano Beach, this another major benefit. Wood-free PVC will be of no interest to termites, and dangerous splinters cannot form when you’re trusting PVC for your deck or dock. Slip resistance. Safety is a big concern when it comes to deck and dock installation. At Keys Deck & Dock Supply, we can design and install PVC decking that’s slip resistant, bringing increased safety and style. 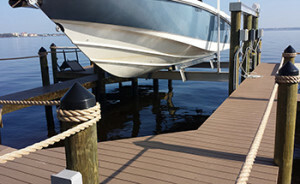 At Keys Deck & Dock Supply, we can install customized PVC decks or docks with many of these benefits. There are also may other benefits of PVC decking in Pompano Beach. What is the best material for dock building? You choose from our traditional PVC decking, and we also even offer decking materials that are 100 percent recycled. We can complete your new dock with our top quality dock supplies in Pompano Beach. To explore all of your PVC options, please click here.